Contrary to their names, Gamma Knife and Cyberknife are non-invasive means of delivering finely focused, high dose of radiation to its target, while causing little or no damage to surrounding brain tissue. Gamma Knife radiosurgery is a treatment for adults and children with small to medium AVMs and other abnormalities in the brain measuring less than 3 centimeters or 1 inch in diameter. 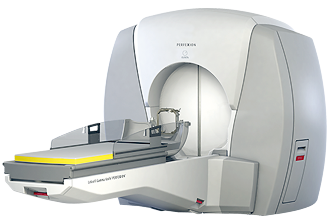 In Gamma Knife radiosurgery, specialized equipment focuses close to 200 tiny beams of radiation on the target. Although each beam has very little effect on the brain tissue it passes through, a strong dose of radiation is delivered to the site where all the beams meet. The precision of radiosurgery results in minimal damage to healthy tissues surrounding the target. In some cases, radiosurgery may have a lower risk of side effects compared with other types of radiation therapy. Also, radiosurgery may be a safer option than traditional brain surgery for some lesions. Gamma Knife radiosurgery doesn’t involve surgical incisions, so it’s generally less risky than traditional neurosurgery. In traditional neurosurgery, there may be risks of complications with anesthesia, bleeding and infection. Radiosurgery doesn’t immediately obliterate the vascular malformation; therefore, the patient is still at risk for hemorrhage while the radiosurgery obliterates the AVM, a process that can take up-to 3 years. During treatment, there’s no pain. After treatment, the head frame is removed and small adhesive bandages are applied where the sterotactic frame was secured. Fatigue: Fatigue and exhaustion may occur for the first few weeks after a radiosurgery. Swelling: Swelling in the brain at or near the treatment site can cause symptoms such as nausea, headache and vomiting. Your doctor may prescribe anti-inflammatory medications to prevent such problems. Hair and scalp problems: Some people may temporarily lose a small amount of hair. Your scalp can become red, irritated or sensitive at sites where a device is attached to your head during the treatment. Factors considered in evaluating a patient for Gamma Knife treatment include a patient’s age and general medical condition, location and size of the brain abnormality and previous treatments. If it is decided that Gamma Knife is not the best treatment option, other treatments will be discussed.